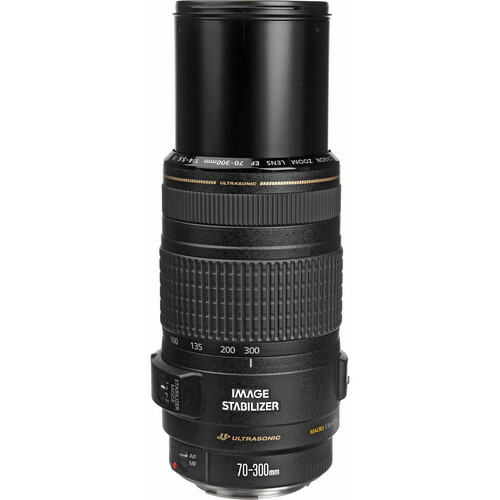 If you’re looking for something cheaper than the popular EF 70-300mm f/4-5.6L IS USM lens or EF 70-300mm f/4.5-5.6 DO IS USM lens at the same f-stop, image stabilization and performance then the EF 70-300mm f/4.0-5.6 IS USM retailing at $650 is one that you should look into. The Image Stabilization feature of the lens offers up to three stops of image shake correction, enabling users to hand hold the lens without issues for much slower shutter speeds than normal. The lens comes with IS Mode 2 which basically detects when the camera is being used for panning and immediately disengages the stabilization system. This lens does not have ring-type but Micro-motor type auto-focusing. However the performance of the same is accurate. If you think that you can live with a bit of compromise regarding the speed of the auto-focusing and the sound of the focusing motor then this lens should be okay for you. On the plus side you get a significant amount of savings. 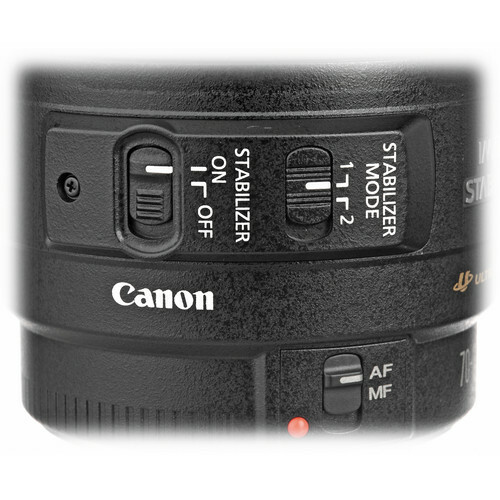 Additionally in order to switch from auto to manual focusing you will have to flick a switch. There is no FTM (Full-time Manual) focusing. IS dramatically reduces image blur caused by camera shake. The EF 70-300mm f/4-5.6 IS USM features Canon’s latest 3-stop IS, a one-stop improvement over its predecessor. This allows shutter speeds up to three stops slower than would otherwise be possible, with no perceptible increase in image blur. Photographers normally shooting a 300mm frame handheld at 1/500s can obtain the equivalent result with a shutter speed of just 1/60s, vastly extending options in low light conditions. Gyro sensors detect unwanted vibrations, triggering the corresponding movement of a correcting lens group perpendicular to the optical axis. This alters the light path, returning the image to its correct position on the sensor or film plane. 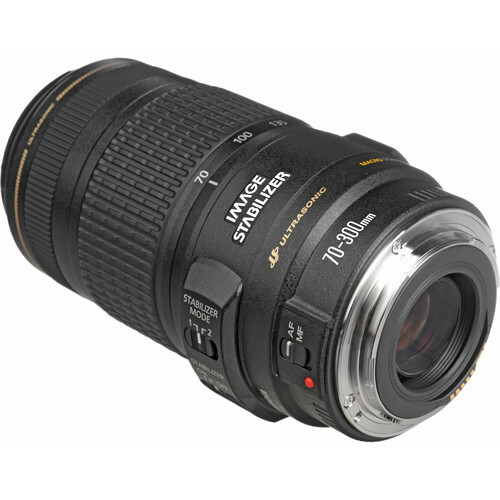 The EF 70-300mm f/4-5.6 IS USM employs an electro magnetic diaphragm (EMD) with acircular aperture. This helps create an attractive, even defocused background when isolating a subject at large apertures. Focal length translates to 112-480mm equivalent in 35mm film format when fitted to Rebel t4i and EOS 650D cameras. The lens construction has a total of 15 elements arranged in 10 groups. The closest focusing distance of the lens is 4.9’ or 1.5 meters. The external dimensions of the lens are 3.0” x 5.6” and it weighs significantly less compared to the other tele lenses of its category at only 630 grams. The lens also has a smaller diameter for which it takes a filter of size 58mm. Accessories for the EF 70-300mm f/4-5.6 IS USM include the lens hood ET-65B and the lens pouch LP1222. In keeping with Canon’s Kyosei philosophy of living in harmony with the environment, the lens features only lead-free glass. If the budget is tight? 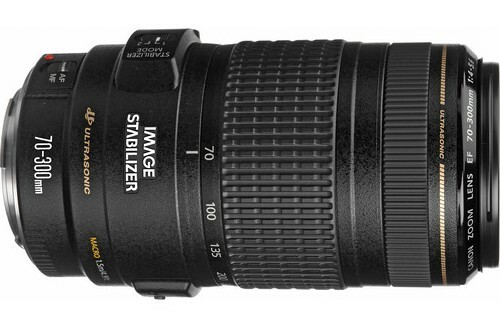 You can also consider buying cheaper EF 75-300mm f/4.0-5.6 III USM Lens with similar specs without IS.